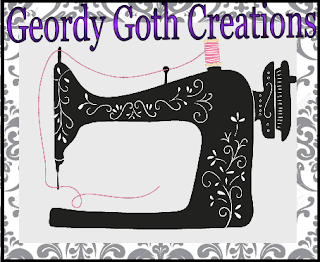 Tales From A Geordie Goth : Bat Fit Update. My first month of Bat fit went exceptionally well until I went on holiday it's fell apart. I'm only sewing while at my sewing classes. After the upheaval of decorating and moving my crap in. I'm slowly getting on top of it. I plan to retake up crafting when the room is more organised. I've volunteered to do some small crafting workshops with a local community organisation. I've taken a shelf up at Bensham Grove to sell my crafts I never sold at the community craft market, and payment is on a commission basis. I'm attending a free local community photography course, is quite interesting and challenging. It's making me think more about photography and perspective. Meeting some of the locals. I found a job; I'm a keyholder for community centre but it's at the bottom of my street. It's not many hours but the money is quite good. I still need to another job with more hours. I'm still gazing in the charity shops but I haven't been purchasing as much. I've sold a couple of items on eBay. My diet hasn't changed but it hasn't got worse, so I'm maintaining my current eating regime. I've lossed a few inches on my bust, waist and hips. I'm happy with that. I have increased the amount I'm walking. My organisation is still pretty haphazard at the moment the house looks like a bombsite. I've finally got around to organising it. I wrote a review in exchange for tickets to see a Fleetwood Mac tribute band with Nights Out In Newcastle. Beforehand, there is number grammatical issues which are going to be resolved in due course. I apologise for this. It was a great night. I'm planning to write a few more in-depth articles; I want to research before attempting to write, and I'm planning to a few male up reviews. I haven't really kept up with all my blogging reading, I'm aiming to catch up when possible. I've met up with a couple friends since my last Batfit, including Jane Breaking The Angel and another friend who I haven't seen before Christmas. I'm arranging to see another in few weeks depending on their person circumstances. I'm also going to another Blogger event on Thursday Night I'll be meeting up with some of the lovely local Bloggers. Congratulations on your new job! :) I hope you'll have a great time in that Bloggers' meeting! Thanks. It was good night and nice to meet up with people again. It sounds like you are really getting involved with your community and putting yourself out there, well done! Thanks, it's mainly because I'm not working at the moment, it's occupying my time. Besides, the library I volunteered is closing in a few weeks, so it something to do instead. Also their is nice community vibes. Sounds like everything is going well! Holidays do but their always very fun ;) Lol. It's not been to hectic I like when things are going on. It'll quiet down for a few weeks. Hi I'm very well thank you. Wishing you a happy vampire day from Geordie Goth Mannor in Newcastle, UK. Sounds like everything is working out good! Congrats on the new job! Thank you that's really sweet to comment. Congrats on the new job and well, good luck on your batfit journey of course!